Colin Powell once said, “Leadership is solving problems.” One might add that listening is a major first step in the process. If you are not a good listener, people will not bring you their problems. If people don’t bring you their problems, you have a problem as a leader. They either think you can’t help them or won’t help them. Either is a leadership breakdown. I discovered early on that my effectiveness as a listener has a direct impact on my effectiveness as a leader. If my team members see me as approachable, they will more likely come to me for help. If I don’t react emotionally to a difficult situation, then they will feel more comfortable sharing their emotions with me. I have learned a few simple rules of good listening that I use on a daily basis. Perhaps they can help you as well. No matter how tempting it may be to interrupt someone when they are presenting you with a problem, don’t. It is best to allow the person to let the steam out. Granted, this may take a while. But interrupting will never help your cause. ﻿Taking notes while someone is speaking is a good way to remain engaged in the conversation. Otherwise, it is very tempting to work on formulating solutions while the problem itself is being explained to you. Note-taking also shows that you are interested in what the person has to say. Emotion tends to exaggerate things. People tend to embellish details when they are upset. Regardless of what someone says, continue with your note-taking and remain calm. You will have your turn to respond soon enough. Once the person speaking to you finishes, say something like, “Now let me make sure I understand you.” Then repeat some of the main points back from your notes. This way, you can be sure you really do understand. You also instill a tremendous amount of confidence that a voice has indeed been heard. Finally, attempt to build rapport with your guest and work with that person toward a solution. Many times, someone simply needs to be heard. 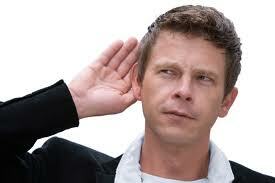 At other times, the fact that you truly listened paves the way for a workable solution to come through. Cultivating good listening skills is one of the most important things you can do as a leader. Take time to hone these skills, and watch your effectiveness soar. Can you think of other effective listening skills? I am the Head of School at Trinity Presbyterian School in Montgomery, Alabama. I also conduct the Sanctuary Orchestra at First Baptist Church in Montgomery. I enjoy reading and blogging about leadership.